If you drive a big ‘ol V8 truck, then here's your chance to get a driver to match. The sole of the driver is a "V." The idea is to get as much weight as possible to the back corners of the club. This raises the MOI of the club and prevents twisting on miss hits. Hippo claims that this driver has the highest legal limit MOI. I like the way the club looks at setup with the mostly black head and the arrow for alignment. I also like the price of this club and I think higher handicappers will certainly see an improvement in driving distance, especially on miss hits. 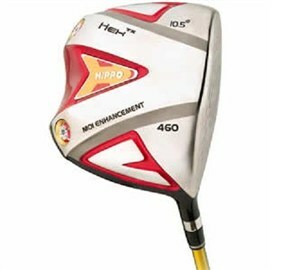 The look of the red and black crown actually reminds me of the PowerBilt Air Force One Men's Geometric Driver. It's pretty darn close to the same shape and design. If you haven't already, take a look at the PowerBilt. It's an interesting concept -- the driver is infused with nitrogen. All in all, when it comes to geometric drivers, my two favorites are the Adams Speedline Driver and the TaylorMade Burner SuperFast Driver. In this category, you won't find any other drivers that are longer and more forgiving.